Brand New LUX spacious 2 bed 2 bathroom. Newly Renovated 3 Bedroom Pet Friendly Apartment. Exclusive 3 Bedroom Phrom Phong Apartment. Stylish Modern Apartment with Swimming Pool Access. Spacious and Elegant Home with Pool Access. Stylish and Comfortable Apartment with Balcony and Swimming Pool. Spacious Modern Home with Pool Access. Chic Apartment in Popular Neighbourhood. Cosy and Modern 20th Floor Apartment with Pool Access. Bright and Stylish 31st Floor Home with Pool Access. Bright and Comfortable Home with Pool Access and Stunning Views. Spacious Home with Private Balcony and Pool Access. Stylish and Elegant Flat in Downtown Bangkok. Large Room, Large Bedroom & Large Kitchen ,Near Ploenchit BTS & Shopping Center. Stunning Modern 23rd-Floor Condo with Rooftop Pool Access. Spacious Modern Apartment with Pool Access. Spacious and Elegant Apartment with Balcony and Rooftop Pool. Stylish and Colourful Apartment with Balcony and Pool Access. Bright and Stylish Modern Apartment with a Balcony. Hello, Please contact me, I am interested in apartments for Rent in Bangkok. Best Regards. Thailand Property is Thailand’s leading online real estate rental resource, listing 2,116 affordable apartments for rent in Bangkok. Save this search to receive emails when new apartments for rent are listed in Bangkok. Rental properties in Bangkok are provided by Thailand’s top real estate professionals and private home owners. The average apartments in Bangkok rental asking price was ฿ 83,688 on 1 Apr 2019 and the average size was 219.9 square meters with 2.8 bedrooms. Agents such as Supreme Real Estate Co., Ltd, Accom Asia Co.,Ltd and RE/MAX CondoDee can also help you speed up your apartments search in Bangkok. You can also create your own rental listing by uploading your apartments for rent for free in two easy steps - signing in and creating a property ad. In addition to rentals in Bangkok. 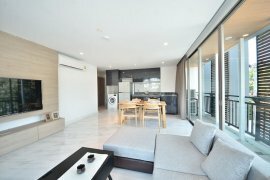 Thailand Property also provides apartments for sale in Bangkok should you like to compare availability.